Creating a realistic water effect often requires a huge amount of particles, which can simply be too much to handle. However, when your desire is to achieve a realistic stationary water effect, there's no need to deal with particles at all. 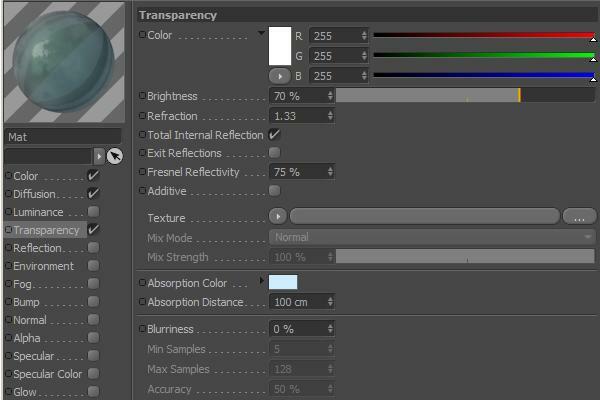 In this tutorial, Dogacan Bilgili will explain how to create a convincing, realistic water effect using some of Cinema 4D's simple tools. 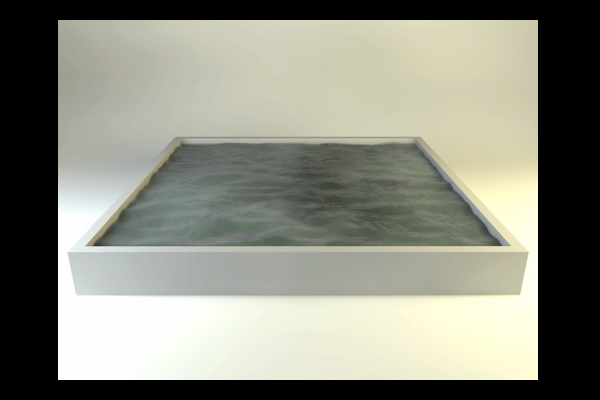 Resulting in a great looking, animated water surface that's much easier to work with. To start, create a shape as shown below. Since it's pretty simple, I won't be showing you how to create it. 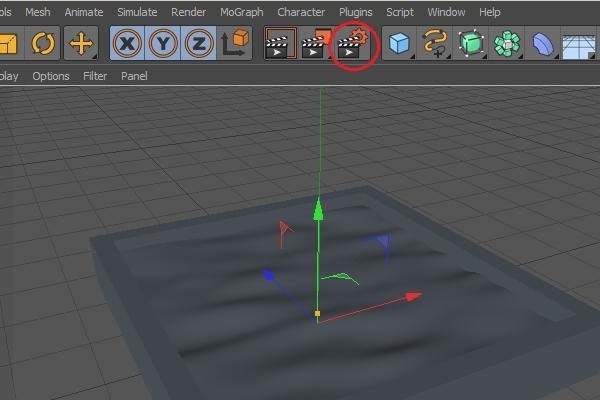 Just use the Extrude and Extrude Inner tools. 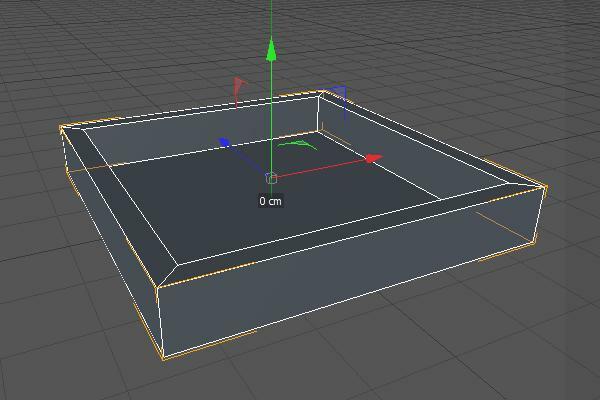 Next, create a Plane object and fit it into the previously created object. Let's call it a "pool". Add a Displacer to the scene. 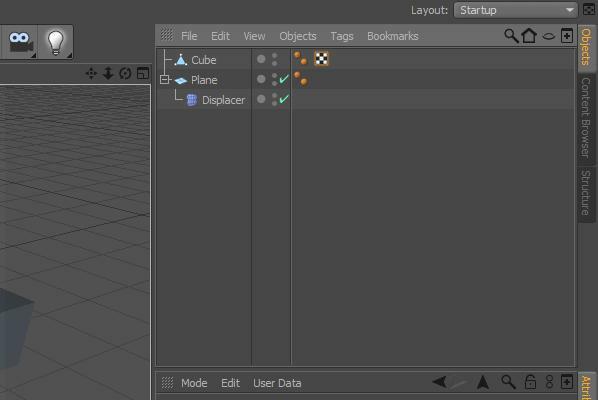 Now drag and drop it onto the Plane object in the object manager screen. In other words, make the Displacer the child of the Plane object. 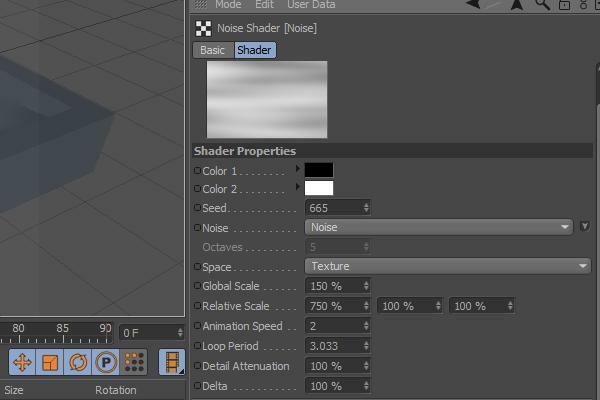 Select the Displacer object, and under the Shading tab, add a Noise shader from the list which appears when the little arrow is clicked. Now click on the Noise to access the further editing options. There are lots of settings to play with. However I won't be explaining all of them, but I will be touching on the ones we will need for our water effect and its animation attributes. So, first of all, we need to adjust the shape appearance of the noise effect to make it look like water. In order to do that, we basically need to play with the Scale options. The first option is Global Scale, this one is for uniform scaling. The second one is Relative Scale, this one lets you to adjust the U,V and W directions independently. Set the Global Scale to 150% and the Relative Scale to 750% (only the first one, leave the 2nd and 3rd ones as they are.) You have to play around with these settings for sure, to get the effect you desire. 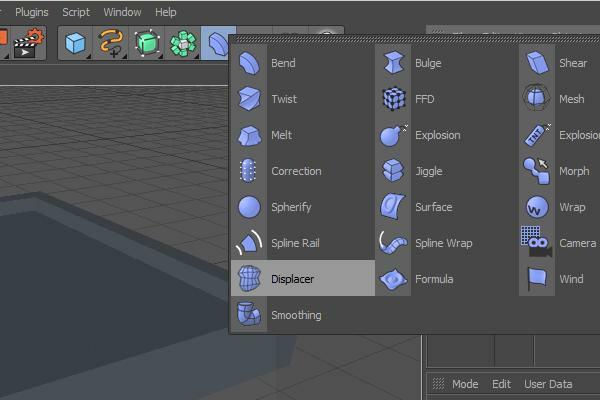 Now jump to the Object tab of the Displacer object. Set the Strength and the Height as you wish. I think what they do is plain to see. The values I've set are; 80% for Strength, and 20cm for Height. For a better resolution, it would be better to use a HyperNURBS object. 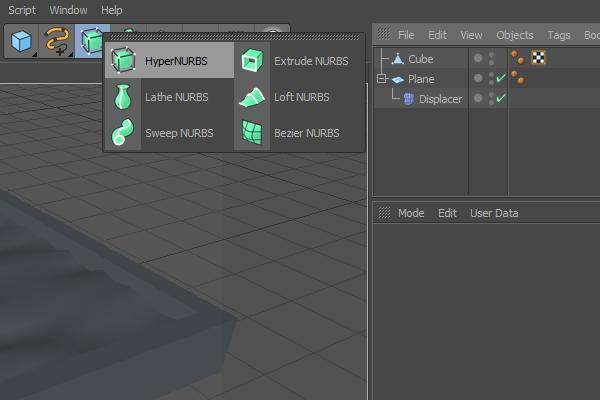 So add it to the Object manager and place your "water" (which is the plane object), under the HyperNURBS. So far I've showed the settings related to the appearance of the effect. Now what I'm going to point out is related to the animation loop of the effect. That's to say, whenever you put this animation into a loop (let's say 90 frames per second and make it a gif.) You may want it's ending frame to match with the starting frame, so the transition will be seamless. Before showing the settings, let me teach you the simple underlying math. Suppose you set the Frame Rate to 30 and the scene has 91 single frames starting from 0 to 90. 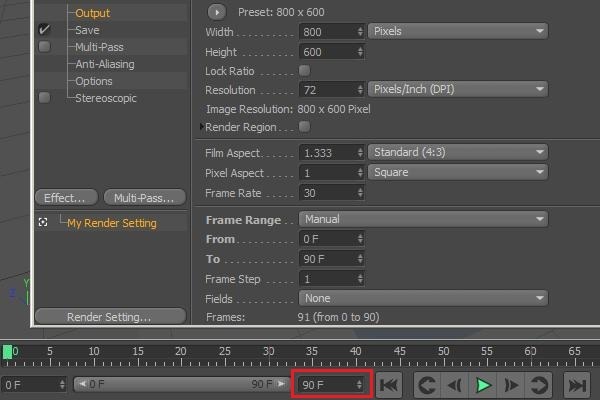 This means that the duration for this animation will be "91/30 = 3.0333", because each second shows 30 frames. 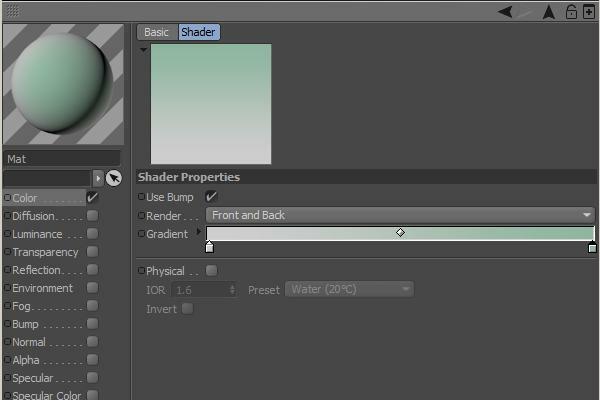 Now by clicking the button shown below, open the Render Settings window. Now, I'm assuming you set the Frame Rate to 30 and the Frame Range From: 0 To: 90. So, 91/30 = 3.0333 is the number we'll use for the loop time. 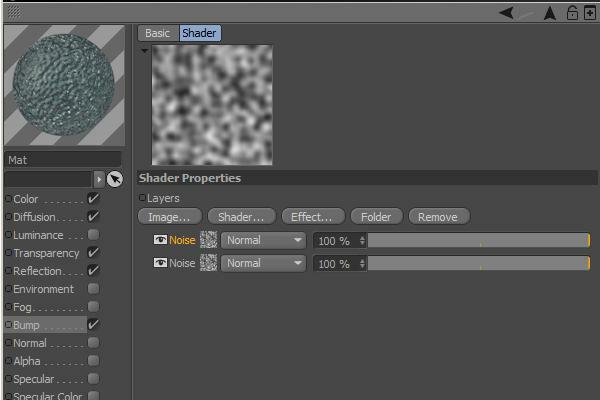 So jump into the Noise shader parameters and set the Loop Period to 3.0333. You can also change the Animation Speed if you wish, by changing the related option. 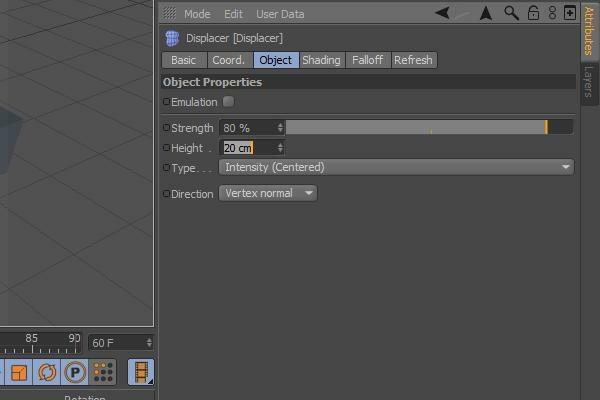 Now hit the Play button and when the animation wraps back to frame 0, you will see that the transition is seamless. Now for the sake of realism, one of the most important parts is the material. Create a new material. 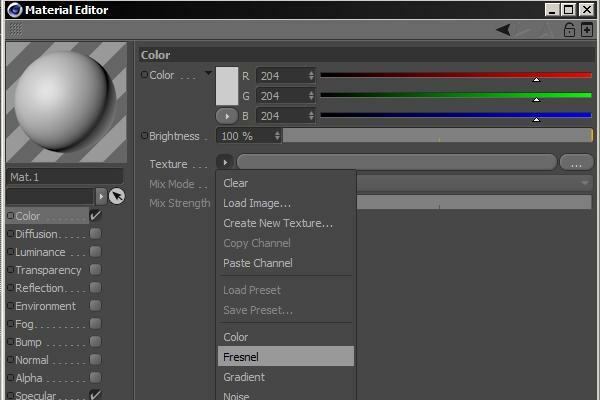 Go to the Color channel and add a Fresnel as the Texture. 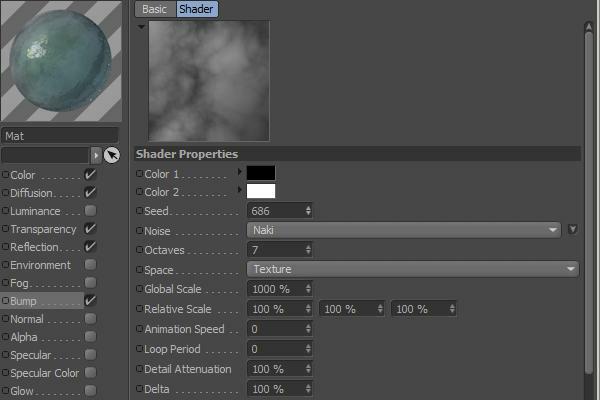 Change the colors of the texture as shown below. Switch to the Diffuse channel. 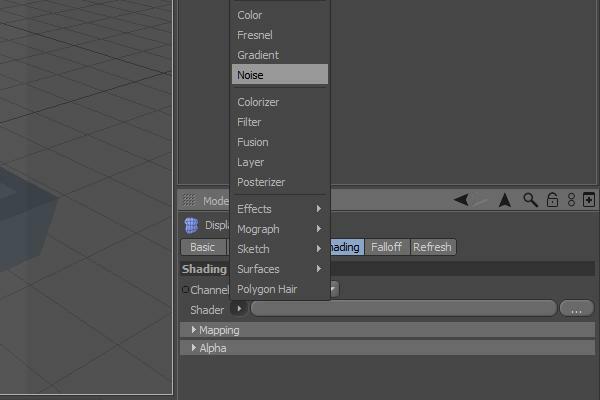 Here add a Noise channel as we added the Fresnel before. 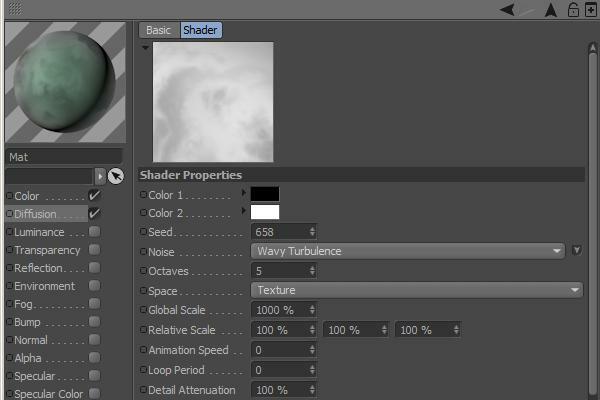 Then choose Wavy Turbulence for the Noise type and increase the Global Scale to 1000%. As for the Transparency channel. The Brightness is set to 70%, Refraction to 1.33, Fresnel Reflectivity to 75% and the Absorption Color as shown below. 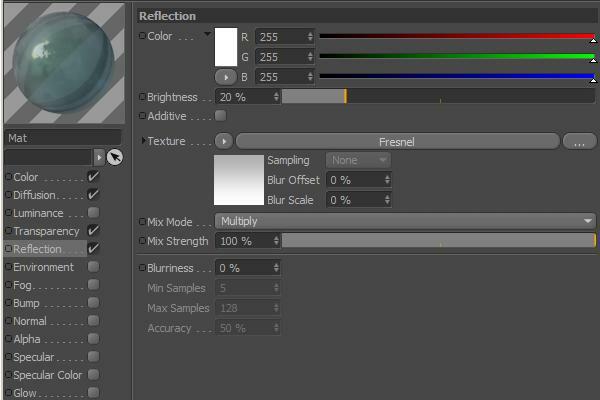 Now turn on the Reflection channel and use the Fresnel texture again, with the colors shown. Decrease the Brightness to 20%, and change the Mix Mode to Multiply. And that's it for this channel. Now jump to the Bump channel. Here add a layer as a texture. Then get into it, by clicking on it. 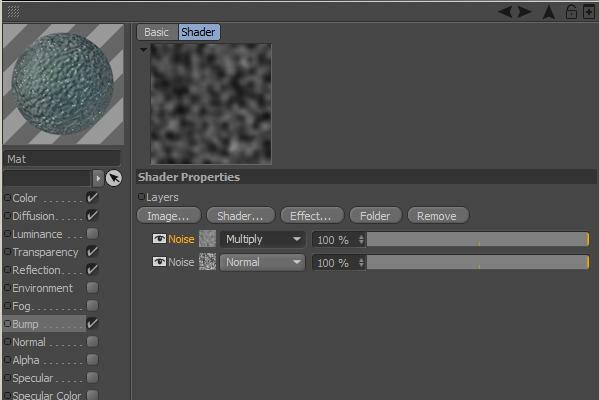 Here add two Noise shaders. 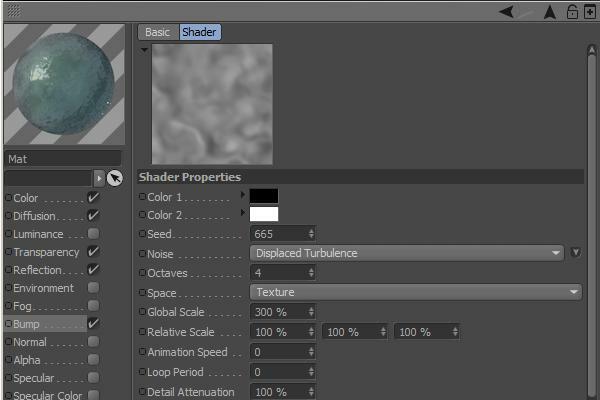 Click on the first Noise shader and under it's settings, set it's Noise channel to Displaced Turbulence, Global Scale to 300% and Octaves to 4. Now go back to and change the type of Noise for this channel, to Multiply. 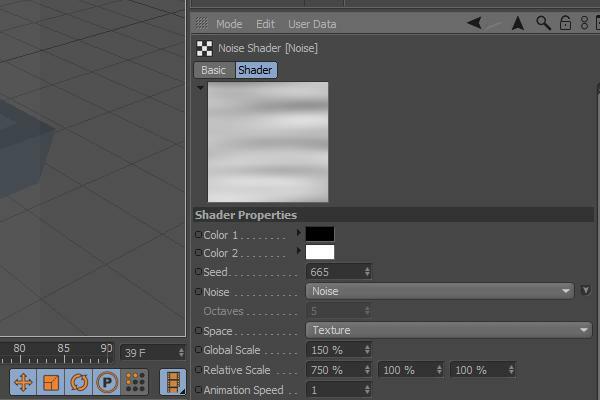 Click on the second Noise shader. The settings for it are as follows; Noise: Naki, Global Scale: 1000%, Octaves: 7, Seed: 686 (here the seed is a random number.) I mean when you change this number, the created result will vary in accordance, so you may change the seed to see a different result. It doesn't make a huge difference though. Now turn On the Specular Channel, and change the Width and Height to 20% and 200% respectively. 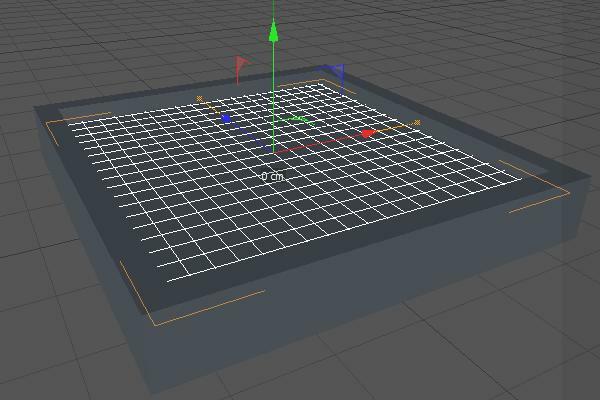 Render your scene with appropriate lighting and use Global illumination in order to achieve the best results for your water material.